You can sign up for Individual or Group account types. Group accounts allow you to share files and templates with other members. You can set up an account thats right for you by selecting Home, School or Organisations from the homepage. If you haven't already set up a trial account before purchasing a subscription, you will automatically receive the 21 day free trial at the start of your subscription. When setting up any account you have to enter a Display Name. Your Display Name will be viewable on any Published documents, so you may not wish to use your full name. When setting up a group account you need to enter a Group ID. The Group ID will be part of the log-in for all users, and also the account's web address, so this should be short and memorable. 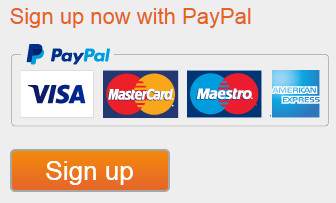 You can sign up for an account online with PayPal. You can choose to pay for Widgit Online with recurring monthly payments or one off annual payments. For recurring monthly payments a PayPal account is required, for annual payments you can checkout as a guest using a credit / debit card. You can order by credit card or invoice direct from Widgit. To do this please contact our sales team. Once your order has gone through, we will supply you with a licence key to activate your account. If you have the desktop version of SymWriter, you can use your desktop licence key for a 3 month extension to your account.